The first chapter of Maverick Sheriff comes out swinging and never lets up. The heroine is in crisis because her baby boy is dying and only one man can save him. How can that not grip a reader by the heartstrings? And then, to find out that the eventual hero and heroine are at odds and should be enemies, how can that dynamic not intrigue and inspire curiosity in a reader? I fell for the plot hook, line and sinker. What an amazing read! I’m completely serious about the impact this book had on me. Every chapter ended with a cliff hanger that placed Jessa in jeopardy, or it ended with a shocking revelation in which the next chapter had Cooper and Jessa dealing with what it means to their lives, their hopes and dreams. Or, people are getting killed left and right and whenever someone hints at giving Cooper the information he seeks to solve a crime another crime occurs to compound the first one. I was biting my nails, shouting at my e-reader and many times overcome with emotion because Ms. Fossen kept the suspense, urgency and action at a fever pitch. The intensity was amazing! There is nothing as yummy as two adversaries getting bit by the passion bug and succumbing to their physical attraction. Whenever Cooper and Lana forget themselves and lose control, it’s great reading. The villain is to be despised. After everything he did and was willing to do is exposed, there is no doubt in my mind that Ms. Fossen created a perfect antagonist. What a demented creep. The only thing that detracted from a perfect score was the ending. For some readers it might be minor but for me, I didn’t get what I needed. If the ending had been the same in a movie in a theater, I would have left with the jitters of adrenaline. After everything Cooper and Lana went through, almost right up until the teeth clenching end, the HEA wrap up came so quick, my head spun. I needed a bit more follow through, even an epilogue, to calm my heart, be certain that the HEA I read was really going to happen and that the new family-to-be was truly abuzz with love, laughter and for the moment, peace. I didn’t get that and after practically hyperventilating through the novel I needed that smooth-over. Although to be fair, I would never have gotten in that situation if the writing hadn’t been so superb in the first place. 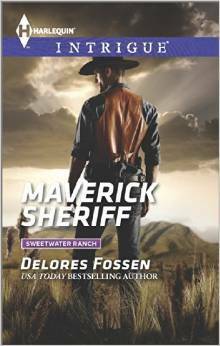 Avid fans of romantic suspense seriously have to consider giving Maverick Sheriff a read. It’s so well done, I don’t know why it’s not been made a movie yet. I’m wowed. I really, really recommend this book!